The popular game show Wheel of Fortune rolled into the Boise Factory Outlet Mall on Saturday, June 21 and the Boise Noon and Meridian Optimist Clubs joined forces to serve refreshments to thousands of hopeful contestants. Approximately 160 people made it to the stage for auditions and free prizes. They may be called up for a screen test when the Wheel auditions return to Boise in the fall. Cindy Wall, President-elect, Boise Noon Optimist Club spearheaded the event along with Gary Arbaugh, Boise Noon Optimist and CBS employee at KBCI Boise. Meridian Optimist Club members provided extra hands for the event. Picture 1. Hopeful contestants-to-be wait for the Wheel to be set up. Picture 2. Bob Nelson, Tom Hammond and Bill Garcia prepare for the noon rush on hot dogs. Picture 3. Linda Jackson prepares a cooler for vending soda and water in the crowd. Picture 4. Rocky Jackson empties water from the coolers gaining the appreciation of kids looking for some cool fun. Everyone is an Optimist when they attend the Optimist International Convention . The fourth largest service organization in the world will gather in Grapevine, Texas July 1-5, 2008 for a dose of inspiration and education and to elect the new leaders for 2009-2010. Current International President Theo Golding will preside over the plenary sessions with nineteen amendments under consideration. International President-elect Don Seivers will be introduced as the International President designate for 20082009. Mark Shriver will be nominated to the position of International President -elect. Read all about the proposed amendments and members vying for international positions in the May Leadership Hotline. Pacific Northwest District Optimists will return and immediately plan for the District Convention in Chilliwack British Columbia on August 15-17. Incoming club presidents, secretary-treasurers and lt. governors will receive training on how to plan and lead a successful year. The governor-elect for 2009-2010 will also be elected at this event as Governor Steve Andersen rallies for strong finish for this administrative year and Governor-elect Peter Smith announces plans for continuing success. Register today for this great event! On May 6, Frank Smith and Joe Jenkins attended the annual communications contest for the deaf and hard of hearing (CCDHH) at the Northwest School for Hearing Impaired Children in north Seattle. Thirteen students from 6th grade to 8th grade competed by signing and reading their entries. Three won top honors, but all students received a framed certificate while their proud parents and families watched. Frank presented School Director, Judy Callahan, with a $300 check from the Auburn Optimist Club, as he has for many years. The school is now in its 26th year. 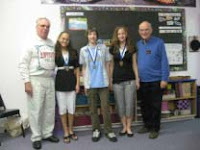 Frank Smith (r) and Joe Jenkins (l) are joined by 1st, 2nd, 3rd place winners: Aaliyah Cheatham, Connor Brown and Kaylie Whitmore. Peter Smith, Pacific Northwest District Governor for 2008-2009 hosted the incoming lieutenant governors at the Menucha Retreat and Conference Center in Corbett, Oregon. The 2008-2009 Optimist International president's theme was revealed. "Give me five for the kids" will focus on five key areas for success: growth, management, communications, leadership and participation. Peter also discussed his goals for the coming year which include ten new clubs between June 2008 and October 2009.